The New York Philharmonic’s historic concert in North Korea’s capital city Pyongyang premieres via satellite, with Music Director Lorin Maazel leading the orchestra in Wagner’s Prelude to Act III of “Lohengrin,” Dvorák’s “Symphony No. 9” (“From the New World”), and Gershwin’s “An American in Paris.” Opening with the national anthems of North Korea and the United States, the program will be transmitted from the East Pyongyang Grand Theatre, with behind-the-scenes coverage by Bob Woodruff of ABC News. The network has had rare access inside the closed society of the Democratic People’s Republic of Korea, where contact with the outside world is completely forbidden to citizens. The Philharmonic visit marks the first by American artists there. “I have always felt that music is a powerful language,” says Maestro Maazel, “in which those of us who are humane and intelligent can speak to each other, in defiance of political and cultural boundaries.” The concert is the centerpiece of a 48-hour visit to Pyongyang by the Philharmonic. Find additional details about the New York Philharmonic, founded in 1842 and one of the oldest orchestras in the world, in the profile. 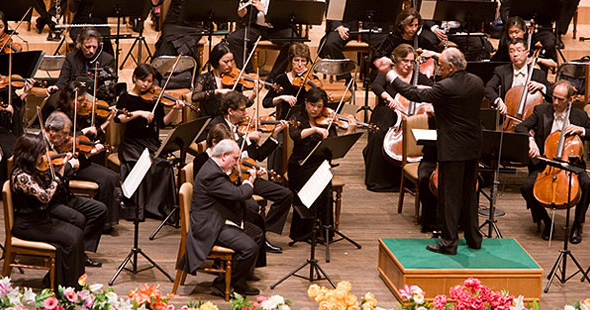 Before becoming its music director, Lorin Maazel led the ensemble in more than 100 performances as a guest conductor. Learn more about his career and work with the orchestra in the biography. Special funding for THE NEW YORK PHILHARMONIC LIVE FROM NORTH KOREA is provided by the Anna-Maria and Stephen Kellen Arts Fund and the LuEsther T. Mertz Charitable Trust.